Josh Gilmore scores for Miami Trace in the bottom of the third inning of a Frontier Athletic Conference game Wednesday, April 10, 2019 at Miami Trace High School. The Miami Trace Panthers varsity baseball team hosted the Iron Men from Jackson High School for a Frontier Athletic Conference game Wednesday evening. Jackson won the game, 3-1. 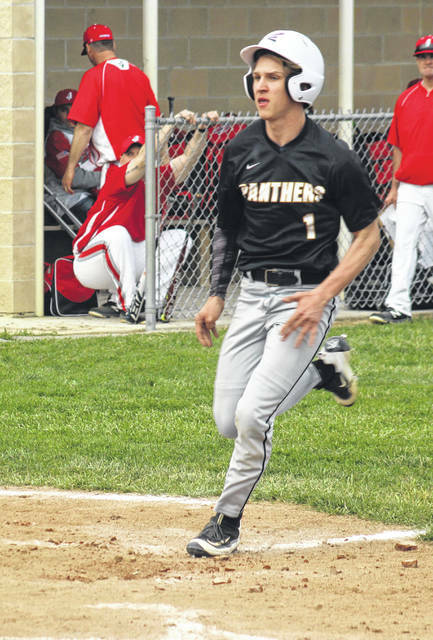 The Panthers scored first when Josh Gilmore, who had doubled, scored from third on a wild pitch. That was the first run of the game. Jackson quickly tied the game with a run in the fourth and added two more in the top of the sixth. Cody Brightman, Austin Brown and Hunter McBee each had one hit for the Panthers. Austin Brown started and pitched six innings, absorbing the loss. He struck out 10, walked two, hit one batter and allowed one earned run. Mason Snow pitched one inning for the Panthers. He struck out two and did not walk a batter. “All three league losses have been kind of the same,” Miami Trace head coach Rob Smith said. “You’re not going to win games when you only score two runs, one run and one run. “In each of these games, we’ve had one bad half-inning, defensively,” Smith said. “Tonight was a prime example. It was 1-1 and we made three straight errors (in the sixth). That’s the difference in the ball game. That’s going to happen. Kids are going to make mistakes. “Early in the ball game we had a chance to score,” Smith said. “I still think we’re a very good baseball team. It’s just that we are not capitalizing on opportunities. Right now the league is so competitive, if you make that one mistake, or don’t capitalize when you have the opportunities, you’re going to get beat this year. There are no shoe-in league games. All six teams are capable of beating each other. Smith spoke about his starting pitcher, Austin Brown. “Austin pitched a great game,” Smith said. “The last two runs were unearned. They scored 18 runs in a game last night against a good Vinton County team. “We’ve got to have the focus, every half inning,” Smith said. Miami Trace (5-3 overall) is at Westfall Thursday and will host the Washington Blue Lions Friday at 5 p.m.
Offensively for Miami Trace: Josh Gilmore, 1-3, 1 run, 2b; Cody Brightman, 1-3, sb; Connor Bucher, 0-3; Drew Batson, 0-3; Austin Mathews, 0-2, 1 bb; Austin Brown, 1-3; Mason Snow, 0-3; Brayden Osborne, 0-3; Hunter McBee, 1-3.